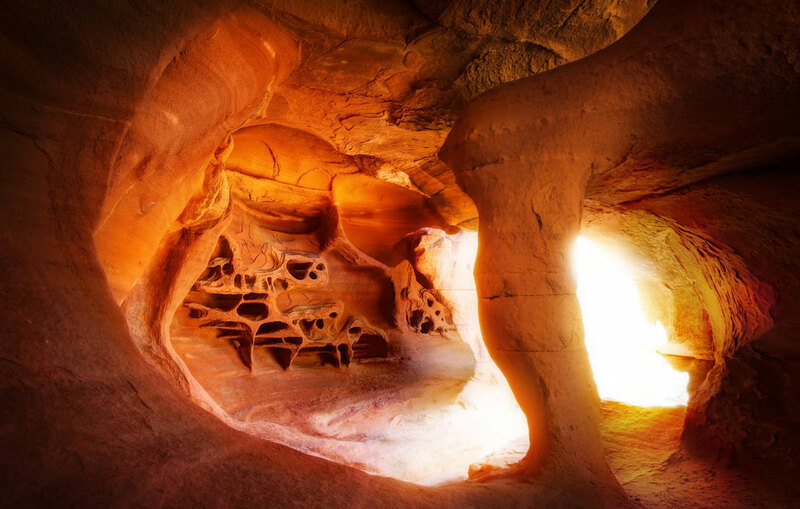 In Nevada’s oldest state park, the Valley of Fire, you may come across an amazing cave with formations in the rock that look like a group of ghoulish goblins. Dedicated in 1935, the Valley of Fire State Park covers an area of roughly 42,000 acres and derives its name from the many red sandstone formations that litter the park. According to other hikers, the cave is also commonly referred to as the Fire Cave and the arch in the foreground is known as the Windstone Arch. While it may appear large in photos, the arch is only about 2 feet tall and the opening you see in the back is roughly 4 ft x 4 ft. If you’re interested in prints, you can purchase online through Trey Ratcliff’s Smugmug account.